Download includes 12 page PDF booklet of notes and images. 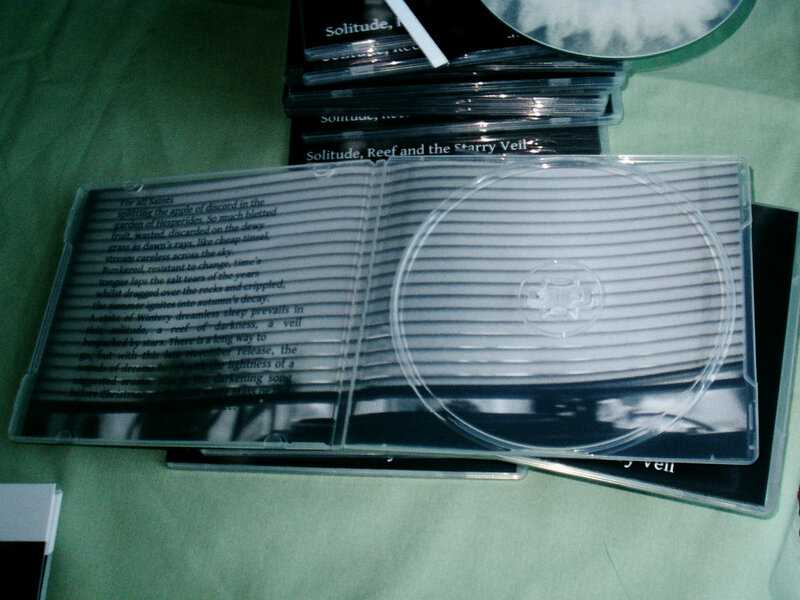 Professionally duplicated CD packed in a flexible plastic case with wraparound cover featuring pinhole photographs by Richard Sanderson and a text by Mark Browne. Also contains three photos of the band. Includes unlimited streaming of Solitude, Reef and the Starry Veil via the free Bandcamp app, plus high-quality download in MP3, FLAC and more. Linear Obsessional Recordings releases the second album by prosaically named improvising trio Browne/Thompson/Sanderson. Like the first album this was recorded in the sonically vivid surroundings of a Girl Guides's Hut in Aylesbury Browne's home town. Where the first album was a document of the trio's very first meeting, this album comes after a whole series of gigs played by the trio, and shows how they have learnt to work together and find their own language. 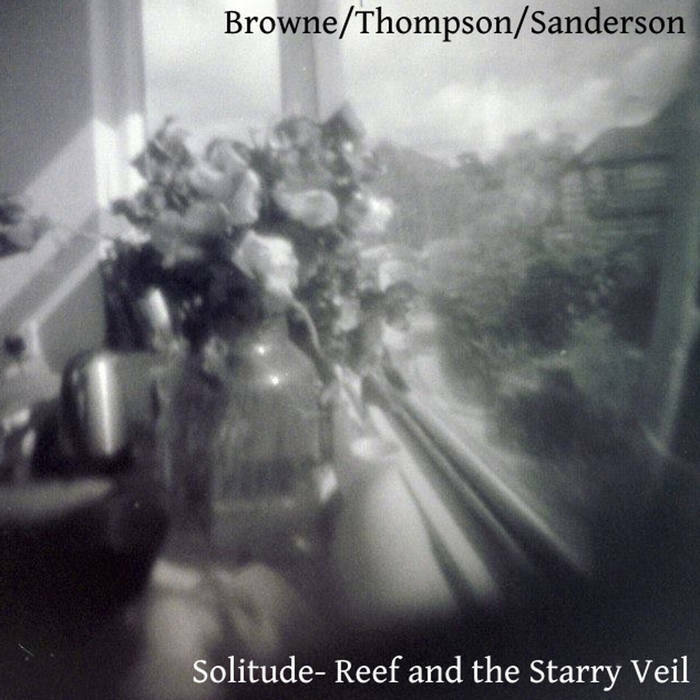 Browne and Sanderson have both expanded their pallettes with additional instruments and sounds - more percussion, feedback etc- whilst Thompson's distinctive microscopic scrabble hangs plangent chords over the racket, or squeezes between the stereo hubbub to explore the territory in between. Whilst very much in the tradition of British Free Improv, there is no trio quite like this one. 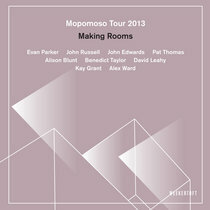 "The joy of The 1926 Floor Polish Variations, the debut recording from Daniel Thompson, Mark Browne and Richard Sanderson, was in the way it coalesced different avant-garde traditions into a weightless, shapeshifting mess of sound that was more like some time warp Fluxus happening rather than a free improvisation session. 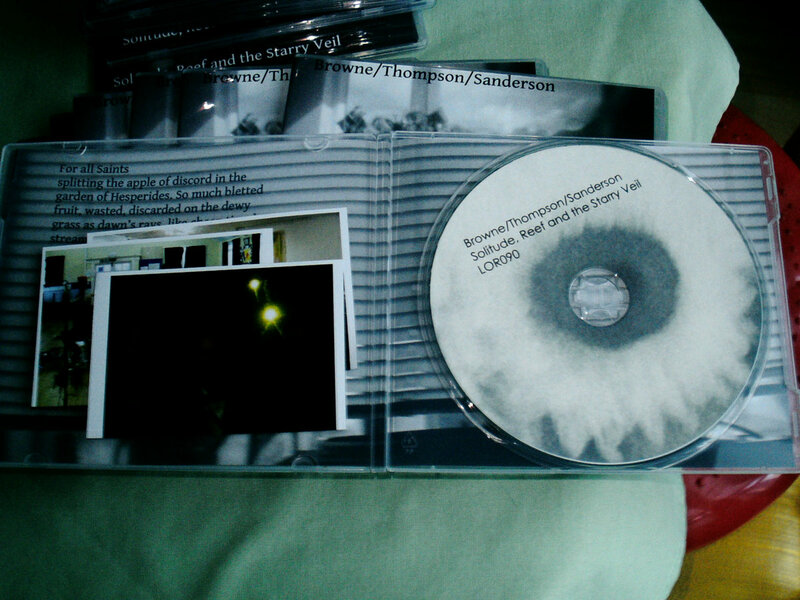 Sanderson’s reductionist melodeon drones slipped easily between sound and silence, their chilly phrases creating an edgeless Zone within which the group’s explorations developed, while Daniel Thompson’s staccato guitar figures drew twiggy lines, as tough and thin as wire. The radically destabilizing force of Mark Browne, meanwhile, added an air of restless agitation to the mix, his scrunching and clacking of various identified objects providing detail and texture, his occasional saxophone blurts punching ragged holes through the delicate haze. A very satisfactory synthesis, then. But things have moved on since. The group has assembled several times for live gigs, their empathic bonds growing stronger each time. Thus Solitude, Reef and the Starry Veil represents another step forward, the trio combining their individual skill sets and deep knowledge of their craft in a work of collective intuition that seems to exist in a world entirely of its own making. 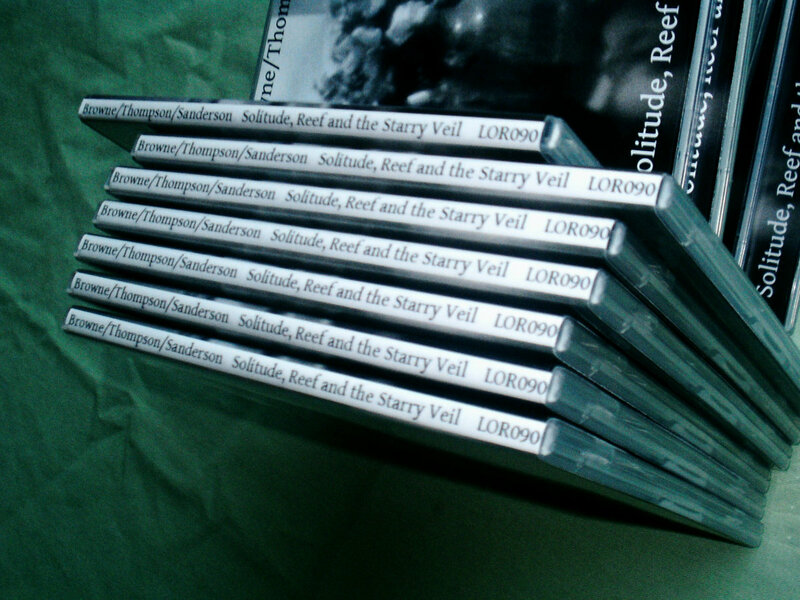 All the constituent parts from The 1926 Floor Polish Variations are still present and correct, but the four long tracks of Solitude, Reef and the Starry Veil see Thompson, Browne and Sanderson shucking off both convention and expectation, their expertise subsumed into a series of gestural explorations that seem content to wander wherever their inclinations take them. John Keats called this negative capability. Mediaeval scholars talked of a cloud of unknowing. We might call it flow, but I prefer to think of it as a great unlearning, the ability to exist as a series of discrete moments of being, structures emerging from a clean slate over time like coral forming on the sea floor. It would, I guess, be easy to lay responsibility for all this at the feet of Mark Browne, whose impatient desire to subvert every cliché of improvisation is ever present. From the cosmic gong chime that’s the very first thing we hear on the album, through to the caustic row of bird calls erupting at the start of The Artifice Surrounding the Proliferation, to the throaty, elastic horn splurges of The Darkening of a Song, Browne’s interventions take the trio to unexpected, unsettling place places. But this is not a dictatorship. 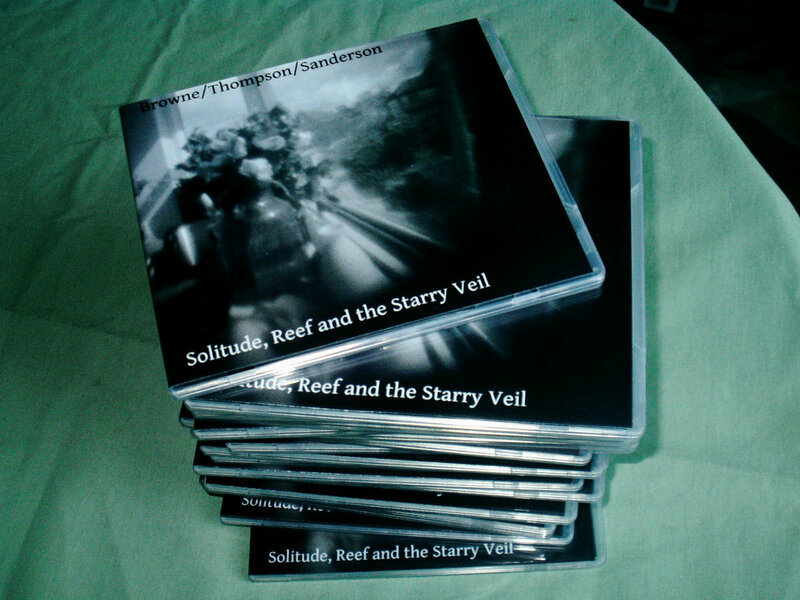 Sanderson and Thompson are crucial to the success of Solitude, Reef and the Starry Veil, not only in providing essential tonal markers but, more importantly, feeding into the creation of a shared sonic space as equal partners. 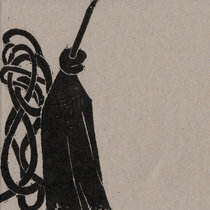 Sanderson’s tin whistle at the at the start of To Suggest is to Create adds a hieratic oomph to his melodeon ooze, and his electronic burbles provide submerged B-movie portents throughout. Thompson, while sticking solely to his beloved acoustic guitar, often stops things from falling apart altogether, the prickly snaps and curt strums like the struts of some mysterious, asymmetrical building created to hold a snowdrift together. His playing charts a line back to the heart of British free improvisation, his plucks and scrapes adding an essential psychic link to that spirit of invention. 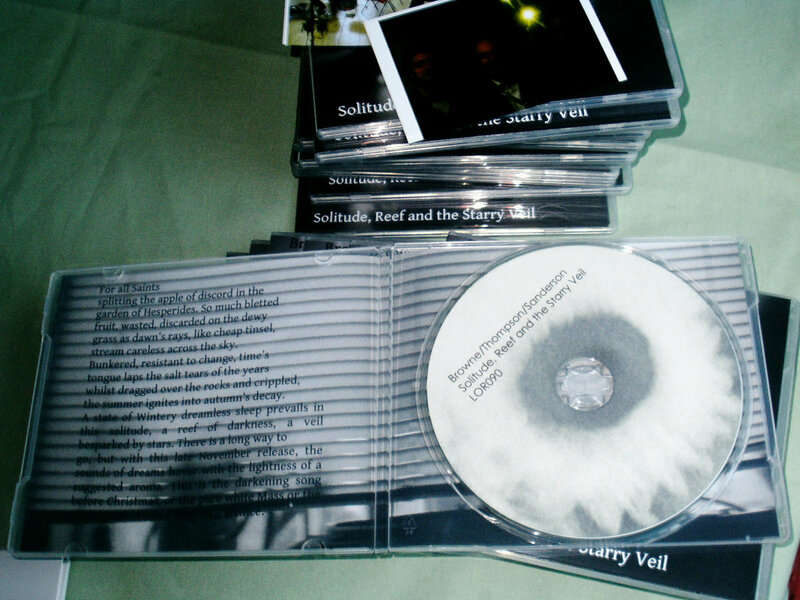 Indeed, taken as a whole,Solitude and the Starry Veil represents what free improvisation is really all about. This spontaneous ground-up construction is often hindered by its own history, players falling victim to their own fear of the blank space and wheezing through stock moves. Browne, Thompson and Sanderson avoid falling into those traps. And while I can’t pretend to understand how they’re doing it, I’m darned psyched to be around while they do."